I’m so excited to share the news that my next release comes out in a matter of a few weeks. July 1st, to be exact. The story is one of nine novellas found in The Courageous Brides Collection. My novella, Mountain Echoes, focuses on Hannah Rose Stockton, a spinster who works for the California School for the Deaf (see my earlier blog post on the school here). As the story opens, Hannah has traveled by stage across the Sierra Nevada to collect a young deaf boy who is to be enrolled in the school in San Francisco. But on the return trip, an accident leaves Hannah to care for the wounded and lead the survivors out of the rugged mountains. In order to write such a story, I needed to research stagecoaches—and that’s what I’m sharing with you today. The Concord Stagecoach was made by the Abbott-Downing Company, which was located in Concord, New Hampshire. The first coach was built in 1827 and weighed in at 2000 pounds. 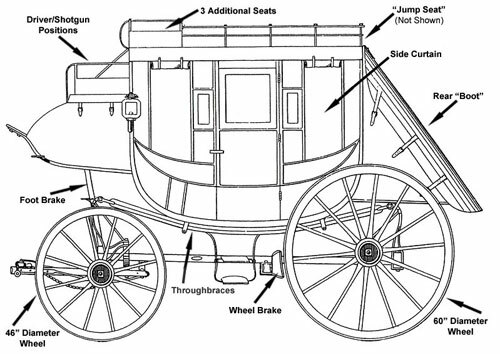 By today’s standards, it was a rough ride, but the Concord coach used a rather revolutionary suspension system, which made it a smoother ride than other wagons and conveyances of its time. Most wagons and carriages used springs to cushion the ride, which lead to a bumpy up-and-down motion. The Concord stagecoach used leather straps, called thoroughbraces, which stretched from the front to the back of the coach, and cradled the stagecoach much more gently. These thoroughbraces led to a swaying motion, far gentler than the harsh jostling of a spring suspension. A typical Concord coach would seat nine passengers on three benches inside the cabin. Three passengers would face backward, leaning against the front wall of the coach. Three would sit facing forward, leaning against the back wall, and three would sit on a backless bench in the middle, holding straps suspended from the ceiling in order to keep their balance. This middle bench was hinged in the center and folded in half to allow passengers the space they needed to get in and out of the coach. Once everyone was aboard, they would unfold the bench seat and lock it in place. Both the driver and shotgun rider would sit on the bench atop the coach, and another six passengers could fit on top of the coach when the passenger space was needed. Passenger luggage was stored in the rear boot, a triangular shaped compartment at the back of the coach. It was secured in place by a leather cover which buckled in place. Larger chests and trunks could be placed on the top of the coach. Under the driver’s feet, a second boot contained the strongbox, mail, and other precious cargo the stagecoach might be carrying. 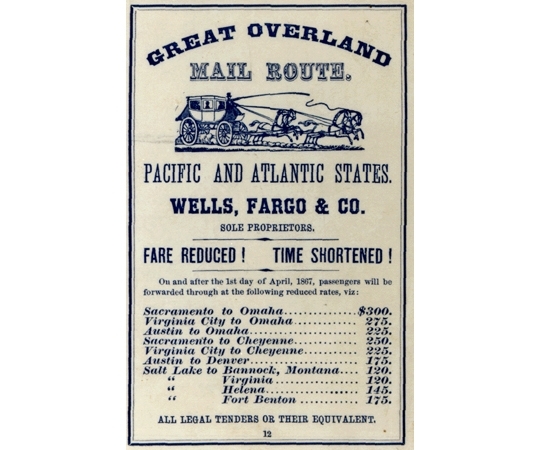 Historical advertisement for the Overland Mail Route. Each Concord was pulled by a six-horse team. The average speed of the stagecoach was 8 miles per hour, and a fresh team would travel twelve to fifteen miles before the stage stopped to change teams. Every forty miles or so, the stage would stop for a brief rest, allowing passengers to partake of a meal before continuing the journey. An average day’s travel was roughly sixty to seventy miles. which is the line featured in my novella, Mountain Echoes. You can get a feel for the distances they would travel in each leg of the journey. 1. Abstinence from liquor is requested, but if you must drink, share the bottle. To do otherwise makes you appear selfish and unneighborly. 4. Don’t snore loudly while sleeping or use your fellow passenger’s shoulder for a pillow; he or she may not understand and friction may result. 5. In the event of runaway horses, remain calm. Leaping from the coach in panic will leave you injured, at the mercy of the elements, hostile Indians and hungry coyotes. 6. Forbidden topics of discussion are stagecoach robberies and Indian uprisings. 7. Gents guilty of unchivalrous behavior toward lady passengers will be put off the stage. It’s a long walk back. A word to the wise is sufficient. It’s your turn: Would you have traveled by stagecoach if you lived in the 1800’s? Why or why not? Leave your contact information with your comment to be included in the drawing for a signed copy of The Courageous Brides Collection. Drawing will be held tomorrow, June 4, 2016. 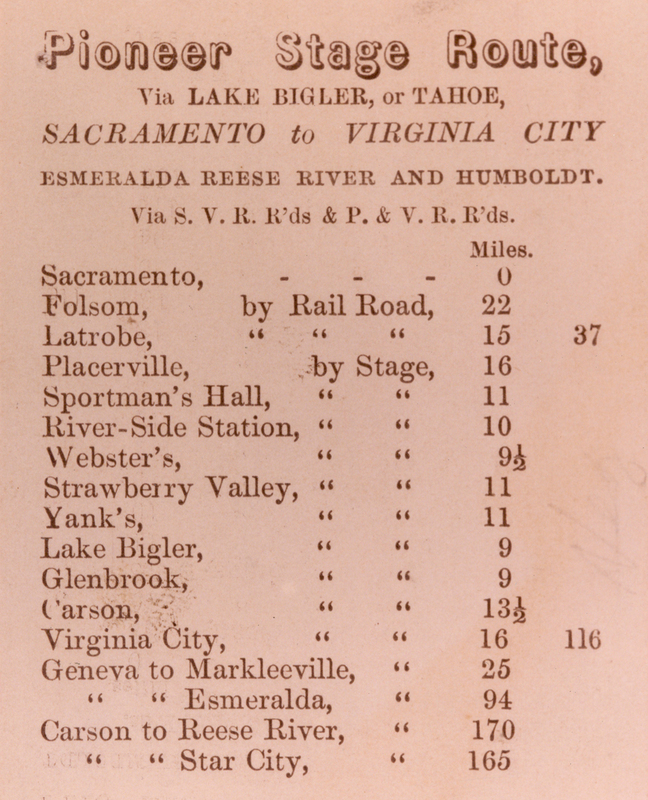 It was probably the norm in those days, so I probably would have traveled by stagecoach. Those rules are hilarious. Thanks for sharing. Thanks so much for stopping by! I agree, the rules made me giggle like crazy. Thanks for the interesting post, Jennifer. The rules and pic of the over-loaded stagecoach gave me a chuckle, although I probably would have ridden the stagecoach- given the alternatives. Thanks for the giveaway opportunity!! Thanks for stopping by, Bonnie. I couldn't imagine riding the stage when it was that overloaded! Ugh. Thanks for your thoughts, Melanie! Glad you stopped by. It was an adventurous time and I would have jumped at the chance to travel by stagecoach just for fun, spitting with the wind of course! Ha! I just loved reading the rules of the road!! Thanks for the fascinating history lesson and the opportunity to win your book and congratulations on your new release, Jennifer. Thank you so much, Diane. I'm glad you stopped by. Being that I believe I was born in the wrong century, I would definitely traveled by stagecoach and still would just for the experience. Thanks for the giveaway and good luck everyone. I'm with you, Debbie--I could see myself traveling by stagecoach for the experience. And I would've traveled by stage back in the day, just because it was the best they had to offer. What a fun post! Thank you, Jennifer. I most definitely would have ridden in a stage coach - rough ride, dirt, and all. Thanks for swinging by, Davalyn. I had a lot of fun writing this post. Since stagecoach was the 'best' way to travel at the time, I do think I'd like to that. Since it is the best way to travel, I would do so. And I've also visited a railroad museum once. 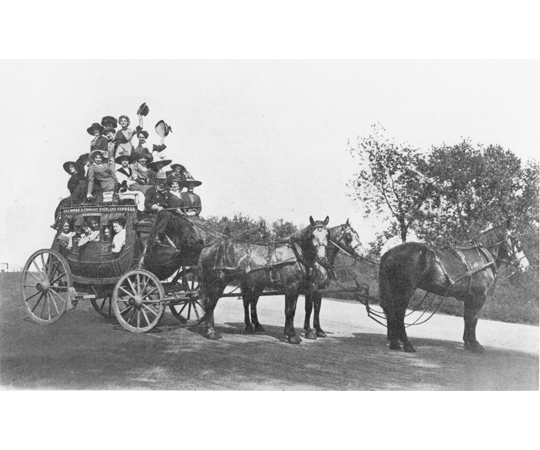 They had the stagecoach as the first modes of "mass" transportation. I think I would enjoy the experience. I've visited a few railroad or car museums that had stagecoaches as well. Always fun to look at them in person. Thank you for stopping by! Jennifer thanks for the fascinating info. I would travel in a stagecoach and pray I didn't get stuck on the middle bench. LOL Good point, Sandy. That middle bench would be a very rough way to travel! Gentlemen rules should still apply today. Men have lost their sense of manner somewhere in not opening the door. Loved the photo of the stagecoach parts. I like to watch movies with stagecoaches so riveting. 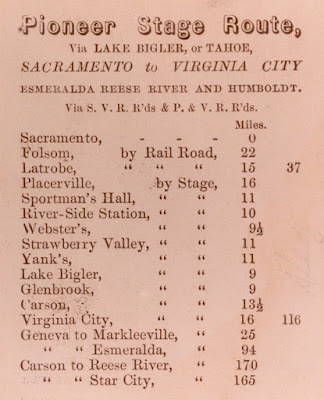 If I lived in the 1800s I would probably travel by stagecoach since that was the mode of travel that was available. It doesn't sound very comfortable, however. This looks like a great collection. Thank you for stopping by, Susan. I agree--stagecoach travel didn't sound like the most comfortable manner of travel. Glad we have better means now! LOL Heidi--YES, the development of deodorant would've made stagecoach travel much more pleasant. Interesting about the stagecoach. cheetahthecat1986ATgmailDOTcom. Perhaps the motion sickness wouldn't have been as bad in a stagecoach because they didn't travel at as high speeds as today's cars do. Thanks for stopping by, Cindi. If I really wanted to get someplace I probably would have. Thanks for the post. I love reading about stagecoaches. teshaw(at)sbcglobal(dot)net. Glad you enjoyed the post, Tammie. Congratulations, Jennifer, on your latest release. 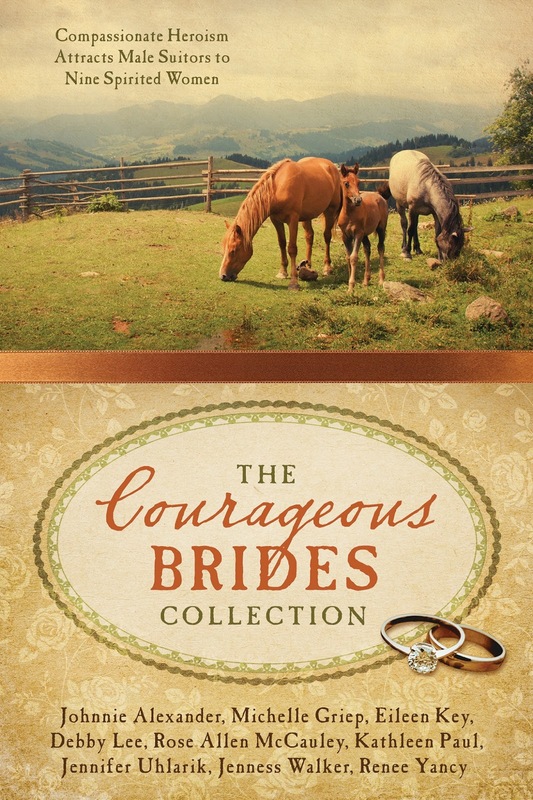 The Courageous Brides sounds like a great collection. I don't know about traveling by stage. I can't imagine the discomfort, especially for passengers on the middle bench. However, I've always been one to be a bit adventurous, so I imagine if there was a good reason, I might have traveled by stagecoach. Hi Kay, thanks for your comment. It's kind of hard to imagine wanting to travel by stagecoach today, knowing what we do about more comfortable means of travel now. But I like that you would be adventurous enough to give it a try. Yes, I would have traveled by stagecoach! Thank you for including the “rules of etiquette”. As we know etiquette was so important during that era. I loved those rules of etiquette, Caryl. Glad you stopped by! Loved the post. The rules were hilarious. Would love to win a copy of the collection. Would love to see you win the copy, Ann. Please leave me your email address to be properly entered. Thanks! I too would love to win a copy of this rousing collection of western tales. Get along little doggie. Please be sure to leave your email address to be properly entered, Sandra! Hi Dawn, thanks for stopping by! There sure were a lot of dangers to stagecoach travel, weren't there? LOL I won't tell anyone you mentioned them, though. Oooh, a brave soul you are, Jan! What a fantastic and informative article, Jennifer. You don't have to enter me in the contest, but I wanted to at least stop by and say hello. Since I love to travel I'm sure I would have ridden the stage at least a time or two. I'd have probably taken the train as well. 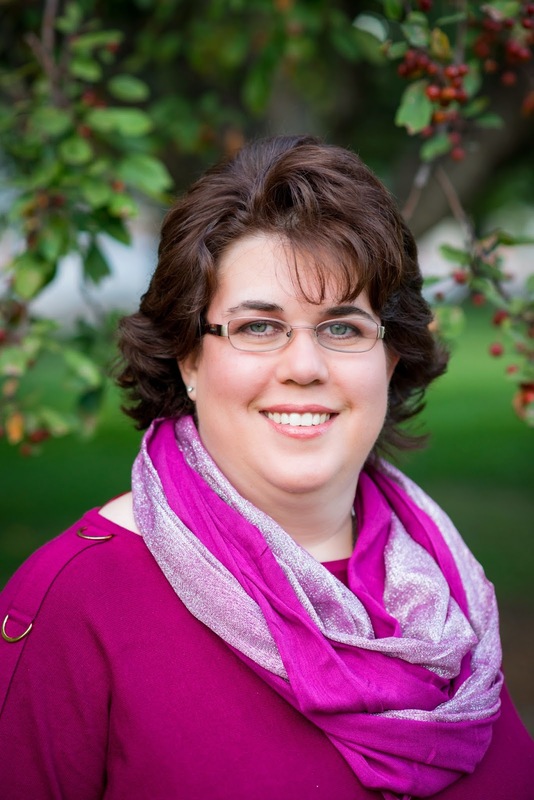 Congratulations Leigh Anne, you won the copy of The Courageous Brides Romance Collection. I will contact you privately with details. Thank you everyone for participating and for your wonderful comments!